The concentration of innovative activity in large and economically advanced cities and regions – often to the detriment of less developed areas – is a well-documented phenomenon (e.g. Feldman and Florida 1994, Bettencourt et al. 2007, Foddi and Usai 2013, Breau et al. 2014). But having innovation condensed in core areas does not imply that all less developed regions are innovation deserts. There are significant differences in innovation capacity among lagging-behind cities and regions, especially between the more dynamic North American economic peripheries and those of Europe. Yet little is known about how innovation unfolds in economically disadvantaged contexts and, more importantly, about how processes of innovation vary across them (Virkkala 2007, Hall and Donald 2009). In new research, we shed light on how innovation processes occur in less developed regions by examining whether processes of innovation, and the factors that impinge upon them, differ substantially between the relatively less developed areas of North America and those of Europe (Rodríguez-Pose and Wilkie 2018). Less-developed areas in North America innovate more than those in Europe. 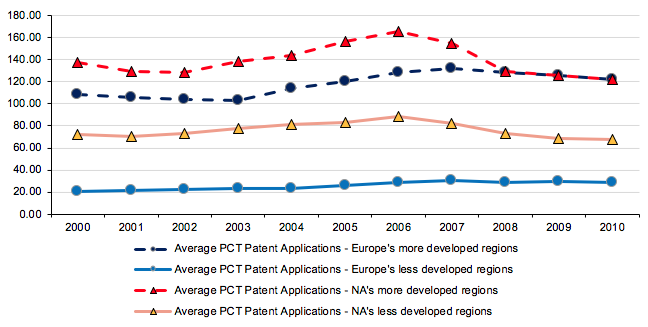 If patent applications rates are used as a proxy for innovation, in both North America and Europe more developed regions are, on average, significantly more innovative than lagging ones (Figure 1). In recent years there has been a degree of convergence in the innovative performance of the more advanced regions of the two continents. Between 2000 and 2006, North America’s more developed regions were decidedly more innovative than their European counterparts. However, and coinciding with the beginning of the crisis, the two continents’ more developed regions were producing similar numbers of patents per million inhabitants. In 2010, North America’s more developed regions generated, on average, 122.22 patents per million inhabitants, while in Europe the same category of regions produced a comparable 121.76 (Figure 1). By contrast, a pronounced discrepancy between the respective innovative performances of lagging regions on either side of Atlantic was still in evidence (Figure 3). While the innovative gap between the two economies’ less developed regions decreased marginally between 2000 and 2010, the 28.71 patents per million inhabitants produced by Europe’s lagging regions in 2010 is less than half the 67.91 patents per million inhabitants in similarly disadvantaged regions in North America. Source: Authors’ elaborations using data from OECD Regional Database. Overall, Europe’s lagging regions are more disadvantaged in terms of R&D expenditure and investment in business R&D functions, in particular, than those in a similar position in North America. They also lag considerably behind North America’s economic periphery in patent production, indicating that the North America’s lagging regions are not only more innovative than those in Europe (Figure 2), but also that their greater capacity to innovate is also at the root of superior economic dynamism. We analyse the factors behind the differences in innovation between more and less developed regions in Europe and North America, covering 71 less-developed and 81 more-developed regions in Europe, and 27 less-developed and 34 more-developed provinces and states in Canada and the US (Rodríguez-Pose and Wilkie 2018). The results of our research indicate that the differences in innovation between North America and Europe, in general, and between their respective peripheries, in particular, are driven by different sets of factors. In the economically disadvantaged regions of North America, processes of innovation are governed by a limited number of elements. First, lagging regions in North America display some ability to transform their relatively high levels of investment in higher education R&D into innovative output – a process that is indicative of the continent’s mature system of university-industry linkages (e.g. Rothaermel et al. 2007). Less-developed regions in North America are reasonably adept at translating knowledge produced by firms in both neighbouring and more distant regions into measureable innovative dynamism. The ability to do so is attributable, at least in part, to the relatively high levels of public R&D investment that contribute to the enhancement of the ‘absorptive capacity’ of these regions (Cohen and Levinthal 1990, Griffith et al. 2004, Vogel 2015). Socioeconomic contextual conditions in North America’s lagging regions also influence their potential to innovative. 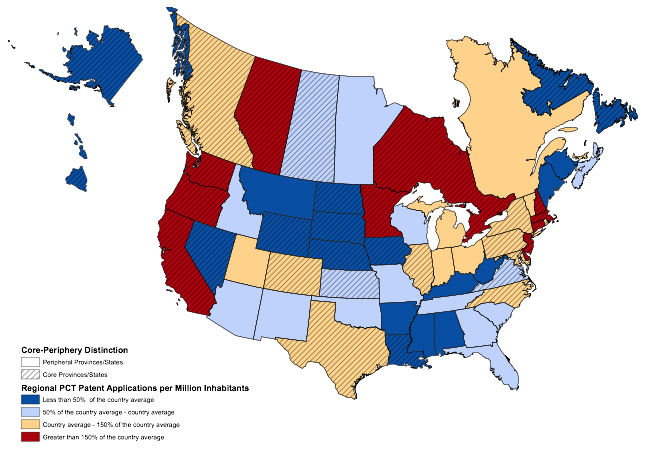 Canadian provinces and US states with a young and highly skilled population are more innovative. The innovativeness of North America’s economically disadvantaged regions is further enhanced by the colocation of individuals and economic actors, and the knowledge-related externalities associated with agglomeration. Innovation in the lagging regions of Europe is a product of a distinctly different set of influences. 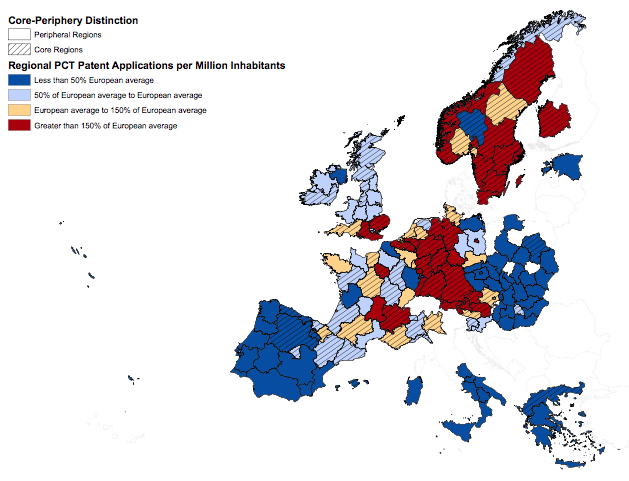 Most immediately, economically disadvantaged regions in Europe are capable of translating business enterprise R&D investment into measurable innovation. The challenge for these regions as it relates to R&D expenditure is therefore not necessarily one of exploitation, but rather one of underinvestment. That is, levels of business enterprise R&D investment in the less-developed regions of Europe lag significantly behind not only those of the Europe’s and North America’s more developed regions, but also those of their North American lagging-behind counterparts. This implies that whatever facility Europe’s lagging regions have for the mobilisation of business R&D activities is largely wasted – or certainly under exploited – due to chronic underinvestment in these functions. The relative absence of dynamic firms capable of investing in R&D in the economically disadvantaged regions of Europe should therefore be seen as a serious handicap for the generation of innovation in these territories. Underinvestment in R&D is, however, by no means the only or the most important factor curtailing innovation in Europe’s lagging regions. In Europe – and in contrast to North America’s economically disadvantaged regions – lagging regions are less able to mobilise the skills of their young (the best educated age group). Persistently high levels of youth unemployment limit the absorptive capacity of Europe’s economic periphery in ways which are not evident in North America. Europe’s lagging regions are capable of drawing upon the knowledge generated via the higher education R&D activities in their immediate neighbours and the public and private R&D activities occurring in more distant regions. The power to mobilise knowledge flowing from distant higher-education R&D activities is, however, contingent on levels of local business enterprise R&D investment and the absorptive capacity they foster. It would seem, at least in some respects, that the less developed regions in Europe draw more heavily upon their more distant neighbours than their North American counterparts. That is to say, processes of innovation in Europe’s lagging region are shaped, to some extent, not only by exposure to business enterprise R&D knowledge flows emanating from more distant regions, but also by exposure to longer-distance government sector R&D knowledge flows. Finally, lagging regions in North America and Europe behave, from an innovation perspective, more like their respective more-developed counterparts than one another. Innovation in North America’s less and more developed regions is fuelled by the presence of research universities and by skilled human capital and agglomeration. In Europe, skills and agglomeration are also central for innovation in both types of regions, as is investment in business R&D expenditure and exposure to long distance business enterprise R&D knowledge flows. Moreover, and in contrast to North America, the presence of a young population in Europe represents more of a barrier to than an asset for innovation. What can be done to increase innovation in less developed areas of Europe and North America? While innovating in the economically disadvantaged regions of North America and Europe shares some similarities, the important differences in innovation processes present a challenge for policymakers. While they can resort to measures that will work in almost any lagging-region context, they cannot mimetically apply policies developed on one side of the Atlantic and expect them to be successful without considerable adaptation to the local context. Generally, lagging regions – characterised by larger endowments of skilled human capital and by the operation of economic actors in close physical proximity – are more capable of generating new knowledge than those that lag behind in terms of their human capital development and within which economic actors and activity are more dispersed and thus less likely to interact. There is also evidence that economically disadvantaged regions on either side of the Atlantic have at least some facility for the absorption and exploitation of extra-local knowledge and that this type of knowledge can catalyse innovative activity. Hence, innovation policies for lagging areas, irrespective of location, should prioritise labour up-skilling and human capital development, and they should incorporate the development of interregional connections and relationships – the so-called ‘pipelines’ (Bathelt et al. 2004) – as a means of importing new knowledge to supplement local innovative activities, or perhaps more accurately, to compensate for a lack of them. Beyond these common traits, however, the differences in the drivers of innovation between less developed regions in Europe and North America are so large that only contextually tailored innovation policies (e.g. Tödtling and Trippl 2005, Navarro et al. 2009) are likely to dynamise their innovative capacity. Bathelt, H, A Malmberg and P Maskell (2004), “Clusters and knowledge: Local buzz, global pipelines and the process of knowledge creation,” Progress in Human Geography 28(1): 31–56. Bettencourt, L M A, J Lobo and D Strumsky (2007), “Invention in the city: Increasing returns to patenting as a scaling function of metropolitan size,” Research Policy 36(1):107–120. Breau, S, D F Kogler and K C Bolton (2014), “On the relationship between innovation and wage inequality: New evidence from Canadian cities,” Economic Geography 90(4): 351–373. Cohen, W M and D A Levinthal (1990), “Absorptive capacity: A new perspective on learning and innovation,” Administrative Science Quarterly 35(1): 128–152. Feldman, M P and R Florida (1994), “The geographic sources of innovation - Technological infrastructure and product innovation in the United-States,” Annals of the Association of American Geographers 84(2): 210–229. Foddi, M and S Usai (2013), “Regional knowledge performance in Europe,” Growth and Change 44(2): 258–286. Griffith, R, S Redding and J van Reenen (2004), “Mapping the two faces of R&D: Productivity growth in a panel of OECD industries,” Review of Economics and Statistics 86(4): 883–895. Hall, H and B Donald (2009), “Innovation and creativity on the periphery: Challenges and opportunities in Northern Ontario,”Ontario in the Creative Age, Working Paper Series. Navarro, M, J J Gibaja, B Bilbao-Osorio and R Aguado (2009), “Patterns of innovation in EU-25 regions: A typology and policy recommendations,” Environment and Planning C: Government and Policy 27(5): 815–840. Rodríguez-Pose, A and C Wilkie (2018), “Innovating in less developed regions: What drives patenting in the lagging regions of Europe and North America,” Growth and Change, forthcoming. Rothaermel, F T, S D Agung and L Jiang (2007), “University entrepreneurship: A taxonomy of the literature,” Industrial and Corporate Change 16(4): 691–791. Tödtling, F and M Trippl (2005), “One size fits all? Towards a differentiated regional innovation policy approach,” Research Policy 34(8):1203–1219. Virkkala, S (2007),“Innovation and networking in peripheral areas:Acase study of emergence and change in rural manufacturing,” European Planning Studies 15(4): 511–529.